There are a couple of reasons why frequency boosting is already an interesting topic. It allows your CPU to reach higher frequencies than it would otherwise reach at stock speed, and that's especially true with AMD's XFR (Extended Frequency Range) and Intel's Turbo Boost Max 3.0, which push up the frequency across one or a small number of cores in lightly-threaded tasks. With AMD, this has been an especially important topic, as some of its Zen-based CPUs have seen higher frequencies with XFR than you can achieve across all cores with overclocking - Threadripper being one example. Intel's Turbo Boost Max 3.0 looked full of promise, identifying the best overclocking core and using it to achieve a higher single-core boost frequency, but following headaches with its launch, I haven't really played with it since. The exception is Skylake-X's launch last year, with the improved version adding another core to the boosting mix as well as drivers that were integrated into Windows 10. Boosting one or just a few cores is especially important with HEDT CPUs, as their boost frequencies are often quite low compared to mainstream desktop CPUs. There's also the fact that overclocking them will often see massive heat and power consumption increases - one reason why Intel's per-core overclocking is potentially very useful and why many have urged AMD to offer this too. Then there's the all-core boost, something that's of particular importance to those that will be using their CPUs for multi-threaded workloads, as it dictates the maximum frequency achieved by all cores when they're all are being used at once. Then you have different boosting depending on the number of cores being utilised. For example, Intel's Core i5-8600K can reach 4.3GHz on one core, 4.2GHz when up to four cores are used, and 4.1GHz when five or all of its six cores are. That information is clearly pretty handy, as it allows for direct comparison between similar CPUs. For example, the Core i5-8400, also a six-core CPU, has one-core, up-to-four-core, and five/six-core boost frequencies of 4GHz, 3.9GHz, and 3.8GHz respevtively, each a fair bit lower than the Core i5-8600K, which could persuade potential customers to opt for it instead of the cheaper Core i5. However, there are some changes afoot this year that will impact all these aspects of CPU boosting. Admittedly, only AMD's second-generation Ryzen Threadripper CPUs are likely to be of any interest to overclockers, who will be able to reach higher frequencies than any of the boosting tweaks we'll see this year, but as well as being interesting for anyone planning to run their CPU at stock speed, the boosting specifications can also be an indication of how well a CPU might overclock and how much headroom there is. I can appreciate this as well as the fact that motherboard manufacturers will regularly tweak the boost frequencies, so stock speed performance on one board may be different to another. However, Intel's figures should come first and provide a benchmark for what we can expect performance-wise, irrespective of system configuration. It's like car manufacturers refusing to reveal 0-60 times or fuel consumption figures because of the differing road surfaces and weather conditions that exist - they're completely beside the point. What we want are figures based on a best-case scenario to help our buying decision, not necessarily what we expect day in, day out in our own neighborhoods. 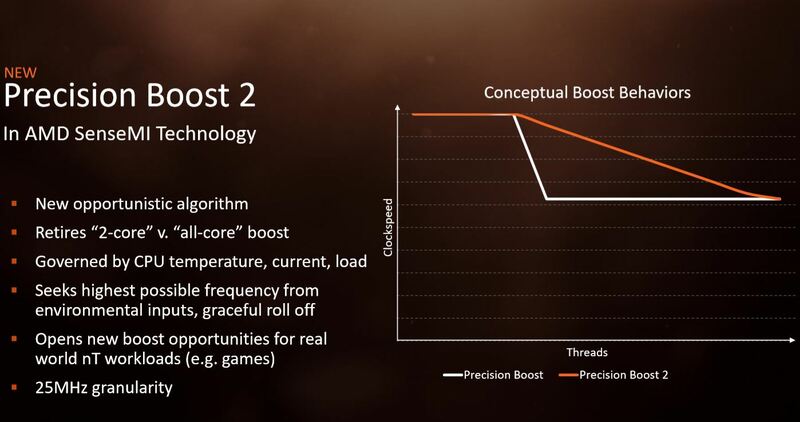 In any event, it's going to be fairly easy for reviewers like me to find out what the boosting frequencies are, so I can only assume this is a marketing move to focus on the higher single-core boost figure and/or to make things trickier for AMD. The latter seems odd, though, given the frequency advantages Intel enjoys practically across the range, but maybe it's just capitalising on this. On a more positive note, there's AMD's revised versions of Precision Boost and XFR. The step change in frequency you saw with Ryzen as you move from single-threaded to lightly and multi-threaded workloads undoubtedly hurt Ryzen's performance, and AMD claims this was especially true in games. Here, several additional threads could often be spawned in addition to the one or two more demanding ones, and while the additional threads weren't particularly taxing, they caused the CPU frequency to fall dramatically when there wasn't much need. This could partyl explain AMD's mediocre performance in some game titles and other benchmarks compared to Intel, but a significantly tweaked boosting algorithm is definitely something to get excited about, as it could mean significantly better performance. Gigabit Wi-Fi, new 300-series chipsets, and more. 2018 looks set for more CPU battles with AMD refining its Ryzen CPUs and Zen core and Intel posed to release low-end chipsets and eight-core mainstream CPUs. The final big CPU launch of the year sees Intel aiming at AMD in the mid-range to give Ryzen a bloody nose, with the Core i7-8700K seeing a 50 percent core boost compared to the Core i7-7700K for not a lot more cash.